This passage reminded exiled Jews of how their God had provided for their ancestors in an earlier difficult time, and how God had demanded of them strict obedience. In prior verses, the writer has told the Gentile Christians at Ephesus how Christ has now reconciled them with God's historically favored people, the Jews. Today's verses demand some changes from their pre-Christian way of life. In earlier verses of the gospel, Jesus has miraculously fed thousands of people. Now Jesus challenges them to find new meaning in miracles, in their history, in bread itself, and in their desire to do God's will. Our Liturgical Setting: We've interrupted our Liturgical Year B trek through Saint Mark's gospel for a five-week sojourn in the gospel of John, Chapter 6, the extended teaching about Jesus as the Bread of Life. In today's gospel passage, John 6:24-35, Jesus cites the people's history, an incident in which Moses gave their ancestors "bread from heaven to eat." As you would expect, Jesus will reinterpret that event and show (or hint) how God's gift to the world in Jesus himself excels what God gave through Moses. The Whole Historical Situation [in 250 words]: In ancient Sumer (modern Iraq) lived a rich, wily fellow soon to be renamed Abraham. We'd call him, and everybody else at the time, a pagan. He followed the mysterious voice of God and moved to Palestine, around 1800 B.C.E., where he made a covenant with God. His grandson Jacob was renamed Israel, and Israel's twelve sons and their families wound up in Egypt seeking relief from famine. The Egyptians and others lumped these and other nomadic people under the name Hebrews. Eventually the Egyptians enslaved the Hebrew descendants of Israel. Around 1200 B.C.E. Moses revived their ancestral religion and led them out of Egypt back to the land Abraham had occupied. (The event is known as the Exodus.) On the way, at Mount Sinai, Moses renewed the covenant between God and the people, their side of the Covenant being expressed concretely in the Ten Commandments. (Today's first reading is set here.) Generations after Moses saw: the kingships of Saul, David, Solomon and lesser kings; the Temple on Mount Zion in Jerusalem; the division into northern and southern kingdoms (Israel and Judah, respectively); the prophets; the Exile in Babylon; more prophets; a dispirited return from exile (when the verses we read today were written); the diaspora (dispersion of many of the people now known as Jews (from "Judah") among Mediterranean pagan populations; occupation of their homeland by Greeks under Alexander, then occupation by the Romans; the coming of John the Baptist; the coming of Jesus of Nazareth; and more. Background of today's text: In the latter parts of that long history, the prophets and the more faithful priests often appealed to the Exodus memory in order to rekindle faith in the one true God, and keep the people on course. In their writings they retell the history with their own concerns giving certain biases to the tale. 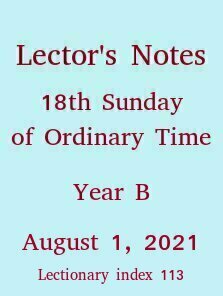 Thus the 5th verse of chapter 16 (absent from the Lectionary selection) says "On the sixth day, however, when they prepare what they bring in, let it be twice as much as they gather on the other days." That and the notion that God's goal is "to see whether they follow my instructions or not" (verse 4) show that this text is the work of priests. They wanted the people to observe the seventh day of the week as a Sabbath, and believed that the way to maintain healthy nationhood was to promote strict religious observance. Make the Lord sound a bit weary and patronizing until his last clause, which should sound resolute, "so that you may know that I, the LORD, am your God." Moses' only sentence in this selection has the quality of "I told you so." Make him sound triumphant. The Historical Situation: On the Fifteenth Sunday and Sixteenth Sunday of this season, the second readings from Ephesians established the new unity of God's once separated peoples, the Jews and the Gentiles (the latter including the Ephesian addressees of this letter). In the reading on the Seventeenth Sunday, Paul encouraged them to live out the consequences of their unification, (we paraphrase liberally) "You have only one religion, so live like one family." This week the Apostle sounds a more cautionary note: Don't continue to behave like you did before your conversion, "You must no longer live as the Gentiles [in a clearer, older translation, the pagans] do." And how might the unconverted pagans be living? Here are verses 18 and 19, absent from the Lectionary: "darkened in understanding, alienated from the life of God because of their ignorance, because of their hardness of heart, they have become callous and have handed themselves over to licentiousness for the practice of every kind of impurity to excess." No salacious details, but you get the idea. iii. and put on the new self, created in God's way in righteousness and holiness of truth. A wall-painting dated ca. 1496 from Bellinge Kirke, Denmark. Instances of this graphic on the Internet seem to go back to Princeton University's Index of Christian Art, specifically The Mills-Kronborg Collection of Danish Church Wall Paintings. The latter says of this painting: "(M-K 04-027) Moses. Sect 2, north arch. 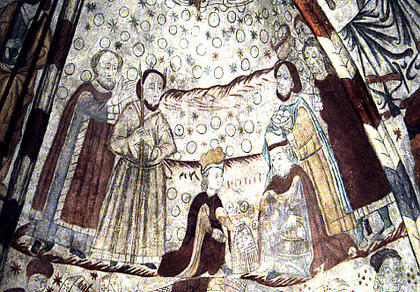 Left, figure and Moses, with horns, center and right, Jews collect manna in baskets. Left pendentive, man with scroll, text. babel. Sorobabel, architect of the Tower. Right pendentive, man with scroll, text. Davit. David. Possible parallel to Last Supper." If, as suggested in that caption, the picture includes the legends "babel" and "Davit", then I suggest that the former refers to the Jewish leader Zerubabel, head of the tribe of Judah at the time of their return from the Exile in Babylon. That links three important leaders of the people over several hundred years, and eliminates the unsupported assertion that the Tower of Babel (Genesis 11: 1-9) had a named architect. Click here for an even earlier painting in the Mills-Kronborg collection that gathers many themes from the acts of Moses, including the manna. To see the curator's caption, click here and find the catalog number M-K 25-063.